It's possible to sum up the tech industry's engine of progress in four words: Apple vs. everybody else. That's been true for a quarter-century in the personal-computer realm, where the Apple product in question is the Mac and everybody else consists of Windows PC makers. And now it's happening with smart phones, a product category increasingly defined by intense competition between Apple's iPhone and the gaggle of manufacturers who have embraced Google's Android software. Unlike the Mac-PC wars, the battle between the iPhone and Android is in its early stages. Both Apple and Google and its hardware partners are trying to dominate the market in exactly the right way: by building the best possible phones. Consumers benefit whether they buy an iPhone or an Android handset from a company such as HTC, Motorola or Samsung. Android is clearly spurring Apple to step up its already impressive game. Since June, it has given iOS, the software that powers the iPhone, one sweeping overhaul and one smaller but meaningful update. It plans to deliver another fairly significant new version in November, with features like built-in printing capabilities. That's a shift from past Apple practice, which involved cramming nearly every meaningful improvement into one yearly megaupgrade. It's also reminiscent of Android's evolution over the past 12 months, during which Google has released versions 2.0, 2.1 and 2.2. Apple may be moving more quickly than ever, but it's still uniquely responsible for what Steve Jobs has called "the whole widget." It designs the iPhone hardware, it writes the software, it provides the default services for buying music and movies. Even the central processor inside the iPhone 4 is an Apple product. The result is the smoothest, most consistent experience to be found on any smart phone. It's no coincidence that the one aspect of the phone that it has the least control over  the AT&T network  is the one that provokes the most grumbling among iPhone users. Ultimately, deciding to buy an iPhone is all about buying into Apple's vision of the one perfect smart phone. Android, by contrast, is about finding the right smart phone for you. Want a phone with a real QWERTY keyboard or a jumbo-size screen? Sorry, iPhone no can do  but Android can. You can even get Android with a slide-out keyboard and a big screen. Or  if you're willing to commit to a two-year contract  one that costs a penny. It's hard to overemphasize the significance of Android's pan-carrier pervasiveness. I have pals who defiantly tell me they couldn't care less about the iPhone unless it becomes available on Verizon  but they remind me of their utter disinterest so frequently that I know it's gnawing at them. I advise these folks not to wait. They can buy themselves a Droid Incredible, Droid X, Droid 2 or Samsung Fascinate. All solid phones, all available right now. Phones that run Android 2.2 match most of the iPhone's key features and add some distinctive benefits of their own. (I'm particularly fond of Google Maps' spoken turn-by-turn driving directions and the built-in support for the Google Voice telephone service.) And yet, I do issue one major caveat to would-be Android owners: no Google-powered phone comes anywhere near matching the overall polish of the iPhone. At times, Android feels like an operating system built by nerds for nerds  it confronts users with unintelligible error messages and requires more taps to accomplish common tasks than an iPhone does, even though Android phones have four standard buttons to the iPhone's one. The standard Android interface is so iffy that some makers of Android phones slather their own look and feel on top, such as HTC's Sense and Samsung's TouchWiz. It helps, but only a little  and it also contributes to the Android platform's generally erratic personality. So does the fact that many Android phones don't ship with the latest version of the operating system; when updates are made available for a particular phone, it's on the carrier's schedule rather than Google's. Then there's the Android Market, the counterpart to Apple's slick, streamlined iPhone App Store. Google's version still has a flea-market-like feel, and it doesn't seem quite finished  why else would it quote app costs from international developers in their local currency rather than yours? Like many people, I instinctively bristle at the degree to which Apple micromanages the App Store. (Even after recently clarifying and loosening the acceptance process, it bans entire categories of programs and reserves the right to nix ones for violating rules that haven't been invented yet.) Actually using the App Store always calms me down: the iPhone still has the most apps, the best apps, the most innovative apps. The more laissez-faire ecosystem of third-party Android apps is improving literally every day in terms of both quality and quantity, but it has a long way to go. People who seek my smart-phone buying advice often ask me what I've chosen for myself. 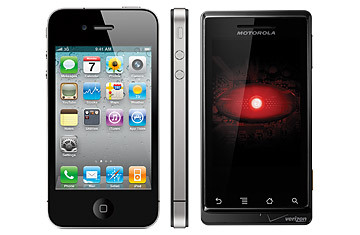 The truth is that I'm commitment-phobic: I own and use both an iPhone 4 and a Verizon Droid. I've been known to say that strapping them together with a rubber band would produce the perfect smart phone. I'm kidding, but only sort of  and I can't wait until further competition between Apple and the Android camp makes it easy to settle on one phone, no massive compromises required. McCracken blogs about personal technology at Technologizer, which he founded in 2008 after nearly two decades as a tech journalist; on Twitter, he's @harrymccracken. His column appears every Tuesday on TIME.com.